A lot of businesses make use of email marketing as a tool to convert their audience into paying customers, while also ensuring they maintain a presence and build relationships with existing customers. For almost 60% B2B marketers, email marketing strategy is vital for revenue generation. In the world of social media, emails still hold that much of importance. To some, email marketing is a second thought and doesn’t get the deserved time and energy dedicated to it. As a result, the email campaigns don’t have the full effect that they should and business owners abandon it, thinking it has no return on investment. The truth is that you have to invest in it if you want it to work. In the beginning, most business owners won’t see the value in email marketing. As a result, time energy and resources are rather dedicated to creating content for other online spaces. These are the types of things that potential customers might not return to, whereas email marketing delivers your marketing message right into their inbox. On another note, once you’ve built up your email list with people who have opted-in (it’s important that they have chosen to be there and you are not just spamming them without their permission), you own that list. Sure, you might have a couple of thousand followers on social media, but you don’t own that following. If Twitter or Instagram suddenly had to disappear, you would have no following and no way to connect with them. Don’t waste your time putting all your eggs in one basket, that’s a huge marketing mistake. To build your list in the first place, you need to give people a really good reason and convince them to hand over their sacred email address and allow you into their inbox. Firstly, you will need to provide excellent content on your website and social platforms to show how great you are at what you do. Secondly, you will need to provide an impeccable user experience for your audience to ensure they can easily navigate around your content and website. Then you need to include lead generation to exponentially and authentically grow your email list. Now you’re probably asking, “what is lead generation exactly?” Lead generation is the form on your site that invites visitors to join your email list. Thus, you need to make sure your sign-up form is attractive, noticeable and uses enticing language to draw people to want to sign up. You may even want to offer a freebie to make it even more irresistible. The most talked about marketing mistakes always mention not testing. There are two types of testing you need to do with your emails before hitting send. First, you want to check for spelling and grammar errors, check that all links work correctly, and your images are displaying too. You don’t want to send out an email to a list of a few hundred people that says “Hello [FIRST NAME]! You’d much rather it say, “Hello John” and “Hello Susan” and not look like you have no idea what you are doing. This is a non-negotiable test that you need to perform. It’s the proofreading step in the process. You should also check how it displays on various email clients like Gmail, Outlook, Yahoo! and Hotmail to ensure it looks good for all recipients. Secondly, you could try out A/B Testing when you start to get the hang of this email marketing thing. This entails sending out two different options (A and B) of the same email to a small segment of your list to determine which one performs better. Once you have this data, you can then send out the more popular one to your entire list. Thirdly, coming up with content in a creative way can be difficult, especially if you’re not good with words or writing. Thankfully there are great services available that can help you perfect your writing to ensure your email list will stick around and enjoy your content. Don’t try writing if you are not good at it. It is better to get an assignment help to do the writing part. It is important to treat your email list as sacred and not spam them with unnecessary content and filler emails, all for the sake of being consistent. Yes, you need to be consistent with your email marketing strategy because you don’t want to suddenly start sending out emails after a prolonged silence. That’s a recipe for unsubscribes. However, at the same time, you don’t want to be sending out pointless emails to keep up your consistency. When recipients start receiving pointless emails that don’t add value to their lives, they will hit unsubscribe, and you can watch your hard-earned email list start to dwindle. To avoid this, ensure that each email you send is attached to a specific goal for your business while also providing value to your list. In a similar sense, you also don’t want to be sending emails too frequently that it starts to clog up inboxes. Work on a regular schedule such as a weekly or bi-weekly email that shares new offers or valuable content. Prevent emails from hitting the spam filter. Besides not having an email list at all, not checking the statistics of your email marketing is probably one of the worst marketing mistakes you could make when it comes to email marketing. This point leads off of the previous one in that your email statistics are gold that you can’t afford to ignore and is a big piece of the puzzle when testing. Each piece of data can help you refine and perfect your marketing strategy to find the sweet spot that works with your audience. You can track anything from Open and Click rates to Delivery rate and Unsubscribes. If you’re sending too frequently or have poor subject lines, you might see a drop in the Open rate. You can determine the effectiveness of your calls-to-action and the relevance of your content from the Click rate. 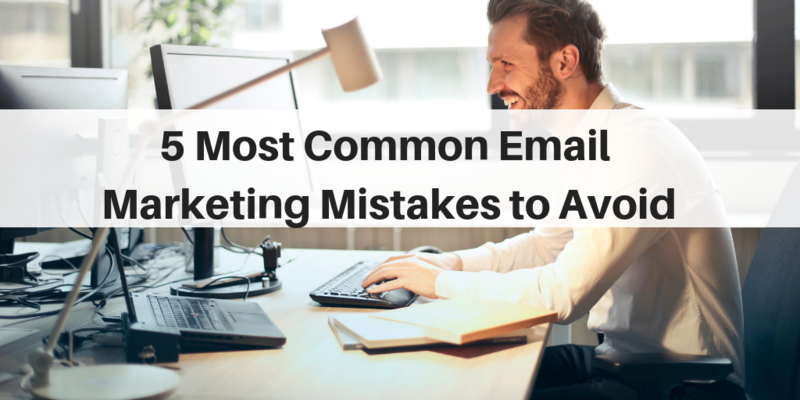 Don’t be a victim of common email marketing mistakes. If you’re a small business, chances are you have been bombarded with information about how important it is to have a good email marketing strategy in place. If you’re already using email, you’ve probably made a few marketing mistakes that have affected the power and impact your email marketing holds. These above 5 points will help you to use email campaigns to full effect. Start trying now. Cathy Baylis is a freelance content writer specializing in personal growth, career development, and leadership. Writing is not only her hobby but profession at the same time. She loves sharing her interests with readers, and she has something to say, for sure. Find her on Twitter.